SINGAPORE, Feb 8, 2018 - (ACN Newswire) - Chinese New Year is the most significant holiday in the Chinese Lunar Calendar. Lasting approximately two weeks, the festivities welcoming the Year of the Dog will start on 16 February, all the way through to 2 March. In addition to preparing for the endless visiting, feasting and celebrations, Singaporeans will also be anxiously reading up on the predictions 2018 will bring. 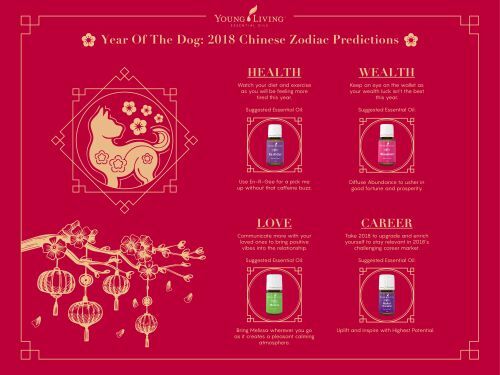 This Lunar New Year, Young Living Singapore has teamed up with Feng shui master, Stephanie Teo to identify essential oils that will best complement each Zodiac, to make this year the best year yet. According to the predictions shared by Stephanie, those born in the Year of the Rabbit, Snake, Horse and Goat will have extremely positive outlooks in their careers. To further enhance the positive outlook, Stephanie recommends using En-R-Gee, Citrus Fresh, Motivation and Clarity essential oils in the workplace to give yourself an invigorating aromatic boost when you need it most. Simply rub a drop of your favourite essential oil on your wrist for an instant mood lift to increase focus and motivation. Predictions show that wealth luck will be fairly decent for those born in the Year of the Dog, Rat, Ox, Tiger, Dragon and Monkey. To enhance wealth, money and prosperity, Stephanie recommends diffusing Abundance essential oil at home. Born in the year of the Dragon, Dog, Horse, Ox, Goat, Tiger, Rooster or Rabbit? Predictions show that it is important for you to safeguard your immunity by watching your diet, having ample rest and de-stress. Use Harmony, Thieves or ImmuPower to protect your body from environmental stressors. While those born in the Year of the Pig, Monkey, Snake and Rat are predicted to have good health this year, you should not take it for granted. Do maintain a healthy work-life balance, avoid over-stressing yourself, and keep a watchful eye out for indigestion, or stomach issues. Soothe digestive discomforts through topical application of Di-Gize or Ginger essential oil on the tummy. Sparks will fly for those born in the Year of the Pig and the Snake. To amplify the love luck in 2018, Stephanie suggests using Joy or Geranium as cologne or perfume to inspire romance and togetherness to bring joy to the people you meet. Those born in the Year of the Dog, Ox, Goat, Monkey and Rooster may have to put in extra effort in romantic affairs this year. With challenges ahead, make use of Release, Forgiveness and Harmony essential oils to balance your emotions when tough times roll around. To find out more about which essential oils best complement your zodiac, kindly refer to the Young Living Zodiac Predictions document. Young Living is the world leader in essential oils and wellness solutions. Founded in 1994 from humble beginnings with its headquarters in Lehi, Utah, Young Living has farms around the world and offices in Australia, Europe, Canada, Japan and Singapore. Well known for its groundbreaking Seed to Seal(R) process, Young Living proudly retails 100% pure essential oils, inspiring millions of people to experience nature's gift of wellness.